What Are Questions to Ask in an MBA Interview? When applying for entry to a Master of Business Administration program, many candidates get nervous about the interview. You may have considered how to answer the questions the interviewer will ask. But what are the best graduate program interview questions to ask when the script is flipped? Knowing the questions to ask in this interview can help you get the information that equips you to make the best decision for your education and career plans. If you’ve gotten to the interview portion of the MBA admission process, you’ve reached the final step of the process. The university has determined you’re a prime candidate for the program based on your transcripts, essays, and test scores. Now, they want to know a little more about you. This is also your chance to get to know more about them and show that you’re an inquisitive and motivated student. The interview may be 20 to 60 minutes long. Make sure you’re punctual and allow yourself extra time at the end of the meeting. You want to be completely present, mentally and physically. If you appear rushed, you might give the impression that the interview isn’t important to you. You may be required to visit the school for the interview. If you don’t live nearby, a faculty member, alum, or program director may interview you over the phone or online video conference. Sometimes, there is more than one step required to complete the interview process. Some schools ask standard questions you can answer in a video recording before conducting an in-person dialogue. You may even have to prepare a project or presentation for the day of the interview. Make sure you read all the requirements so you follow the interview process seamlessly. Why are you interested in continuing your education? What types of MBA are you interested in? Why are you interested in this MBA program or university? What skills do you hope to obtain? What qualifications or experiences do you have that will contribute to the program? How will this program help you reach your goals? Tell us about a challenging situation, how you resolved it, and what you learned. Why is the bus door located next to the driver? How many airplanes are flying over the United States right now? Even if you don’t know the answer to these questions, indicate that you understand how to find out the solution by asking strategic questions. If you’re applying for an EMBA program, you will be evaluated differently than someone who is coming straight from college graduation. You’ll be asked questions about your résumé and career. Tell a brief story about yourself that summarizes your career trajectory, emphasizing recent positions. Include one or two points that demonstrate your strategic thinking or problem-solving abilities. Interviewers also want to know how you’ll balance school with your job and personal life. Acknowledge that this can be a challenge, and give examples that demonstrate you can handle pressure and take on the additional demands. The MBA interview questions to ask your interviewer are just as important as your responses to their queries. Graduate schools want to know that you’re committed to this path. It helps when they see you’ve researched their school or program. They will also assess your level of curiosity and analytical skills based on the questions you ask during the interview. Can you tell me more about the specific program and concentrations available at this institution? What is the program’s biggest limitation? What groups or organizations can students in this program access or join? Does your program use business simulations and experiential learning? What is the best advice you would give to an incoming student? When applying for an EMBA, you’ve already been in the workforce for a while; you need to demonstrate the strengths and interpersonal skills you’ve gained. Don’t neglect to prepare EMBA interview questions to ask just because you have confidence and experience in an established job. There are some graduate school interview questions you should never ask. Don’t waste the interviewer’s time by asking logistical questions already addressed on the school’s website. What kind of salary can I earn with an MBA? Preparation is key. Go to the school’s website to find out if they tell you what to expect or what MBA-specific questions they will ask you. You might also search online for articles or forum posts written by previous candidates, which can give you an idea of what the process will be like. Be authentic and honest. The school has already deemed that you look good on paper. Now, they want to see what sets you apart from everyone else. Don’t lie or pretend to be perfect. Show you have an open mind and a willingness to learn. Prepare personal examples to reference during the interview. Schools want to see you can apply in practical ways the knowledge you gain. A strong first impression is crucial to succeeding during the interview process. Show you are unique, you will contribute, and you can adapt to a changing environment. Interviewers want to know about your strengths, weaknesses, and personal and professional accomplishments. With this knowledge and confidence, you are prepared to make your mark in an MBA interview and advance your career. Still unsure about your upcoming MBA program interview? Contact mbainfo@augsburg.edu to talk with Augsburg University’s MBA professionals who can offer advice from years of experience. An Master of Business Administration is the most popular master’s degree in the United States. Whether you already have a solid career, you’re searching for a job, or you consider yourself an entrepreneur, you might wonder about getting an MBA. Why earn an MBA? The degree is widely accepted by employers and opens doors to future advancement and promotional opportunities. Business education has adapted to stay relevant to current trends, including the globalization of business and the drive for innovation. One of the best reasons to get an MBA is that you become more marketable to employers. Just scroll through the job listings on Monster to see how many have an “MBA preferred” indication. It used to be that MBAs were the degree of choice for people going into finance. Today, all types of industries are hiring people with these degrees. Tech companies are getting business school graduates on board in order to stay competitive. Hot jobs for MBA graduates include mid-level management and executive positions. Companies prefer hiring people who have earned MBAs because these students are usually better educated and positioned for roles in strategic thinking, problem-solving, and ambiguity management. An MBA program does more than give you specific knowledge; it provides experiential learning opportunities to help prepare and train students for the rigors and processes necessary to lead successful businesses. How will the MBA help you in developing your skills? When you’re working toward this degree, you don’t just learn; you consistently use your knowledge. This is a vital characteristic of any leader, manager, or entrepreneur. You need to apply and interpret the data analytics in order to quickly transform ideas into profitable action. Many people ask, “Is an MBA worth it even if I’m already established at a successful organization?” We’ve examined how corporations benefit from hiring employees with MBAs. What are the advantages of an MBA for you? On the most basic level, you will learn more with an MBA than someone who enters the workforce after getting a bachelor’s degree. Those students may gain real-world experience, but the entry-level positions they take don’t give them the advanced knowledge they need to understand the subtle nuances of business. Continuing your education after an undergraduate degree prepares you to start at a higher level when you do get a job. MBA graduates often move into more challenging and prominent positions at an accelerated rate. At the same time, many MBA programs look at applicants’ work experience during the admission process. Therefore, you might want to consider getting that entry-level position while you’re earning your bachelor’s degree to gain a competitive advantage. Why get an MBA if you already have a job and have started your career? MBA graduates are often offered a higher salary than direct-from-industry hires and students who have just graduated with an undergraduate degree. Therefore, if you’re considering employment elsewhere, you’ll be likely to get a pay boost. Even if you stay at the same organization, you may see a salary increase after earning an MBA. The average salary for MBA alumni is $142,000 per year. Depending on your lifestyle, you can pay off your student loans fairly quickly at that rate, making the investment financially lucrative. The average payback for an MBA is about four years. Plus, unemployment rates for these graduates are low. An MBA program gives you ample networking opportunities. This can help you make connections that will allow you to grow your current business. It can also give you the security of knowing you’ll have help and connections to a variety of companies and industries if you want to change careers. A Master of Business Administration is not just a generic term for a business degree. There are a few different types of MBA and distinct concentrations to choose from. An executive MBA, or EMBA, is typically a two-year program that’s directed at people with at least five years of managerial experience. This is ideal for people who have already started their careers. A global or international MBA has a diverse student body. It exposes students to global policies and considerations and is ideal for people who want to work outside of the United States. Strategy – Explore a general knowledge base surrounding business theory and the factors that affect a company’s success or failure. This can help your career if you want a big-picture focus, have ambitious goals, and desire a versatile degree that can be used in many industries. People with a strategy MBA degree often go on to become executives, entrepreneurs, supervisors, and analysts. Corporate finance – Learn to maximize the value of an organization by understanding objective function, investments, financing, dividends, and valuation. Operations – Gain knowledge and experience in supply chain management or logistics. This involves facilitating production and manufacturing, managing company resources, and mediating relations with everyone involved in the process. Entrepreneurship – Prepare to develop and lead your own businesses. Students learn strategy, business ethics, social responsibility, and problem-solving. Management – Focus on allocating resources, solving problems, and working with people on various projects. What can you do with an MBA? Graduates with this degree can get a variety of high-ranking positions in almost any industry. People with a corporate finance MBA may pursue careers in venture capital firms, in commercial banks, and as chief financial officers at Fortune 500 companies. After earning an MBA in operations, many graduates get jobs as operations, supply chain, or logistics managers; consultants; and inventory control managers. An entrepreneurship MBA can help you launch your own organizations or work in a leadership or management role within a company. Graduates with a management MBA can pursue positions as management consultants or managers or supervisors in any industry. The only question remaining is: Where will you go and what will you do with an MBA? Have questions about how an MBA can help your career? Explore Augsburg University’s MBA program or contact mbainfo@augsburg.edu to talk with MBA professionals today. A Master of Business Administration (MBA) is a highly prized graduate degree. It offers a wide range of knowledge and skills that are helpful in many industries. There’s a lot to look at, from accreditation to admissions criteria for an MBA. You may wonder if getting an MBA is worth it. The answer is different for everyone, but those who decide to earn one gain a competitive advantage. Whether you are a few years out of college or have been working for 10 years, an MBA degree will help hone your skills. The course duration of an MBA depends on the type of program you attend. There are different types of MBA degree programs, and they all have varying lengths. How long does it take to get a traditional MBA? A traditional full-time MBA program length is about two years. The program usually starts in either late August or early September with a couple of short breaks and a longer two- to three-month break during the summer between the first and second year. Most students opt to do an internship during the summer break. As a full-time student, you can expect to take classes throughout most the day during your first year. After you finish class, expect a few hours of homework and other activities. During your MBA years, homework may include reading textbooks and case studies, working on projects, and writing essays. Many students go to class activities such as bar nights, dinner parties, and other social gatherings. Many schools offer presentations from successful business people as well. Days off may include comprehensive studying for the coming week. Some universities specialize in other fields. Besides the time commitment, the average cost of a two-year MBA is $130,000. How long does it take to get an MBA degree online? An online MBA may not have a defined length of time. Some online MBA programs are self-paced learning and can take multiple years to finish. Most people take about two years to complete an online MBA. Universities all around the country offer online MBAs to students who choose to study off-campus. These programs typically require about half of the credits that a full-time MBA requires. 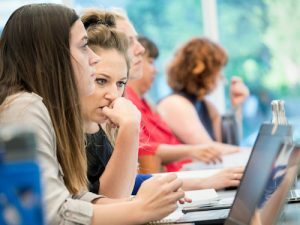 They’re an excellent choice for working professionals and business owners who want an advanced degree but don’t have time or flexibility to go to a campus for classes. Students spend an average of 10 to 15 hours a week outside of class doing work. Online MBAs cost significantly less than a traditional MBA. The average cost ranges from about $35,000 to a little more than $39,000. An online MBA cuts down on costs like transportation and living expenses because students don’t have to worry about commuting to class or staying close to a particular university or college. How long does it take to get an MBA degree if you go to school part-time? Part-time MBA students take classes at night and on the weekends. They’re popular among working professionals working to change careers or improve their prospects. The part-time MBA program can be completed in about a year, or up to five years depending on the program. The shorter programs are accelerated, which means they move faster and require more rigorous studying. These programs can be less of a financial burden than full-time programs, because you can still work while attending them. Expect to spend seven to eight hours a week doing homework on top of any work you may have for your job. The time commitment may make it hard to spend time with family or go out with friends. Many top-tier part-time MBA programs aren’t cheap. The average cost is about $110,000, slightly less than a full-time MBA. However, a part-time MBA may spread the cost over an extended period, and you have the advantage of the income from a full-time job while completing it. How long does an accelerated MBA take to complete? And accelerated MBA is an excellent option for people who want the benefits of an MBA but don’t have two to three years to earn the degree. An accelerated MBA takes between 10 and 24 months to complete, depending on the program. This makes an accelerated MBA an attractive option for someone who has a year to dedicate to education. The work is rigorous for an accelerated MBA. Universities cram in two years’ worth of learning in a single year. Expect to study all the time and give up your free time if you decide to get an accelerated MBA. Break times are shorter, lasting about a week instead of a few weeks in a traditional MBA. The price is significantly lower than a traditional MBA. Some programs from state universities start in the tens of thousands of dollars, while you’re looking at about $100,000 at an elite school—that might sound like a lot, but it’s roughly $40,000–60,000 less than a two-year program. How long does it take to get an executive MBA? An executive MBA is a great way for entrepreneurs, people in middle management, and executives to learn the necessary skills to take their career to the next level. It can take anywhere from a year to three or four years to get an executive MBA. Each program is different, and there are online and on-campus programs available. They’re designed for individuals who are already employed. Typically, classes meet at night a couple times a week or on weekends. The executive MBA works around the busy schedule of a high-level working professional. An executive MBA isn’t cheap; many programs cost over $100,000. Though that’s a large number, it shouldn’t be out of reach for most people interested in getting one. Many are already making six figures a year and continue to work while they get their degree. Some employers offer financial assistance for executive MBAs, because the companies reap the benefits as well when that employee grows in business savvy and skills. If you are considering pursuing an MBA, you will likely need to devote a large amount of time to complete the program, typically one to two years. Expect to spend multiple hours dedicated to schoolwork each week in addition to class time. Additionally, if your college or university offers networking events for MBA students outside of the classroom, it would greatly benefit you to attend them. The decision to continue your business education and attend graduate school is an important one that requires the consideration of many different factors. How long does an MBA take to complete? The answer is entirely dependent on which degree program you choose to enroll in. Request specific MBA program information or contact the business professionals at Augsburg University to find out which program is best suited for you. The Master of Business Administration (MBA) is a widespread post-graduate program. It is a versatile master’s degree that offers extensive value. One of the greatest questions to ask when considering any prospective program is wondering where it will lead you. The MBA is no exception. If you’re asking yourself, “What can I do with an MBA?” consider the skills you’ll learn with an MBA, the benefits of obtaining an MBA, and what post-MBA career paths are available. An MBA program offers many skills that can open opportunities in the future. Different programs will emphasize different skill sets. However, there is a general focus that many MBA programs share. An MBA addresses a broad spectrum of topics related to business. An MBA covers quantitative topics like economics, statistics, data analytics, finance, and accounting, and qualitative business areas like leadership, organizational behavior, ethics, communication, and management, as well as entrepreneurship. Along with practical knowledge in a wide variety of business fields, MBAs provide an assortment of soft skills, sometimes called “people skills.” Enhancing your business knowledge is powerful, but many employers seek more than just a knowledgeable applicant. Matriculating in MBA courses develops leadership, critical thinking, and analytic abilities. These courses also help build communication and teamwork. All of these talents will help you become a better leader and advance your career goals after obtaining an MBA. There is one crucial question to ask before delving into the options of an MBA: is an MBA Worth it? Evaluate the benefits of an MBA and the options that an MBA can open for you. Now that you know some of the skills taught by MBA programs, consider how those skills can be used and what you gain by obtaining an MBA. One of the most influential purposes of pursuing higher education is to advance your career. An MBA degree helps you advance your job prospects and opportunities. Having an MBA increases the appeal of your resume and increases the ability to market yourself. Additionally, the skills you learn in an MBA program can increase your confidence in a job interview, giving you an advantage over other applicants. Where you get your MBA matters. The number of people getting an MBA is increasing. To stand out from the crowd, recognize your potential school’s standing and what level of name recognition it offers. Obtaining an MBA from a top-rated institution will provide you with better opportunities than obtaining one from an online-only institution. What Can I Do After Obtaining an MBA? With the knowledge gained from the rigor of an MBA degree, return to the question at hand: “What can I do with an MBA?” An MBA is a flexible degree path. There are many things you can do with an MBA, and there are many MBA career options that are often taken by MBA graduates. The job of a management consultant is to analyze the managerial practices and procedures of a company. The consultant will then advise the company on strategies to improve their management systems and processes. Additionally, management consultants detect potential issues within a company’s infrastructure and provide consultation on how to reduce those problems. Management consultants must have a firm understanding of the principles of business management. They must have strong analytical skills to deconstruct the practices of a firm and detect issues in those practices. This career is a great fit for MBA graduates. A marketing manager oversees the overarching marketing plan for a product line, division, or company. Marketing managers are in charge of organizing, forecasting, and planning the marketing plan and bringing the plan to fruition. This process includes setting budgets, conducting market research, designing and enacting marketing campaigns, and managing the company’s marketing team to achieve these tasks. MBA recipients learn the fundamentals of business, and marketing is a key area on that list. They gain skills in leadership, ethics, finance, communication, and management, all of which are essential skills in leading a marketing team. The MBA is a multifaceted program, and the responsibilities of an operations manager are similarly varied. An operations manager oversees the day-to-day operations of a company to ensure that everything runs smoothly and corporate goals are met. These duties may include policy creation, logistics, data analytics, ethics, production, forecasting inventory, assisting in marketing, setting and reviewing budgets, and managing aspects of employment for your personnel, like scheduling and performance reviews. Operations managers must be flexible; they require diverse knowledge and skills. This vital adaptability and preparation for a variety of tasks and situations are gained through MBA programs. Investment bankers provide leaders with investment advice to grow their capital and increase the value of the organization. They do this by providing insight into the purchasing and managing of debt and assisting in the transition during mergers or acquisitions. Investment bankers ensure that all paperwork is in order and all regulations have been met. An investment banker requires a combination of economic and business expertise to navigate the complexity of financial deals being made. They must be adept at critical thinking, finance, data analytics, and possess distinct attention to detail. This specific knowledge and skill set are foundational in MBA programs. Unlike the other fields we have been discussing, a financial advisor doesn’t necessarily work with businesses. Instead, a financial advisors typically deal with individuals. They offer financial advice and financial planning for people’s future. Financial advisors may help someone plan for retirement or simply offer investment advice to increase individual wealth. It is the job of a financial advisor to ensure their clients make good investments and create plans to ensure their client’s future. As you can imagine, a financial advisor must have a strong understanding of finances and the economy. Additionally, a financial advisor must be good at analysis to determine the best plans for their clients and the communication skills to articulate those plans to their clients. These skills are core features of an MBA. So, What Can You Do With an MBA? You began by asking, “What can I do with an MBA?” Now you have some specific examples of what’s available to MBA graduates. The Master of Business Administration enhances your knowledge of common business principles and areas. It boosts your skills for working in a business, making you the type of candidate that businesses are looking to hire for their top positions. An MBA opens a plethora of post-MBA career paths to consider, offering you a diverse path forward. Take a step closer to the career you want. Contact business professionals at Augsburg University or request specific MBA program information. It’s one thing to decide the time is right to get an MBA. It’s another thing entirely when you see how many different types of MBA programs there are to choose from. A Master of Business Administration is a valuable degree with a variety of ways it can be earned. How do you decide between different MBA types? There are several ways to analyze the different programs. Note what types of MBA programs sound good to you. Your first impression may help guide you in the right direction; however, there are many other factors to evaluate first. You may want to be promoted in your current organization or prepare for a new opportunity at a different company. An MBA degree is a powerful way to demonstrate you have the experience and knowledge to excel in a new position. An MBA is worth it for people with undergraduate degrees who want to be positioned to work in leadership roles or start a new business. Different MBA types provide a solid foundation of business and leadership knowledge and hands-on opportunities for experiential learning with experienced professors and other students seeking different MBA degrees. One of the biggest differences among these MBA types is the amount of time they take and how busy MBA students are during each of the semesters. How long does it take to get a degree in different MBA programs? In general, it takes from one to four academic years to earn an MBA, depending on the different types of MBA programs. Full-time MBA programs may only take one year. A part-time program could be more than three or four years of courses. An executive MBA or online MBA program will likely take about two years, requiring your focus on top of your normal work and life schedule. 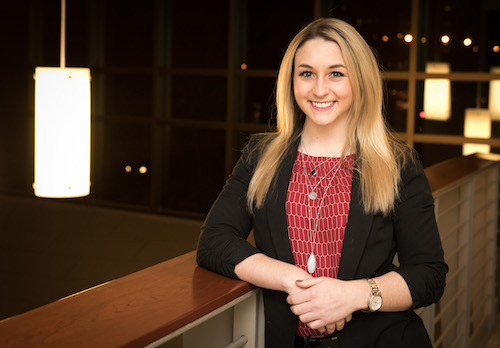 An accelerated evening MBA program, however, is an innovative, strong choice for working professionals who are driven to complete the degree in two years. Online, some MBA programs allow you to choose how heavy or light your course load is each semester, but that will also determine how long it takes you to complete the degree—the fewer courses you take each semester, the more semesters you’ll have to take courses. An entrepreneurship concentration MBA includes studies on ideation, concept development, situation analysis, identifying core competencies, prototyping, and market introduction. 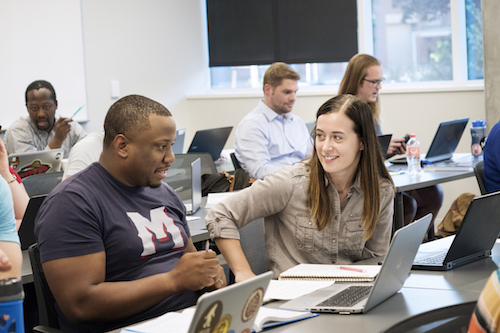 MBA entrepreneurship students learn to collaborate and iterate on market opportunities and potential solutions, and turn a business idea into reality by assessing risks before new developing products or services. Finance concentration MBA types focus on the financial aspects of business like accounting, investing theory and practice, portfolio management, and international finance. A leadership concentration covers the foundations of leading an organization, acting as a strategic leader, integrating leadership theory and practice responsibly, and gaining cultural competence to be an effective leader in international settings. How much money can you make with different MBA types? Earning an Master of Business Administration degree increases your chances of getting a higher salary at your current company and help position you for opportunities with other companies. In a survey of people who hold different MBA degrees, the data suggests that those who work in management earn around $146,000 annually by the middle of their career (about 15 years or more after graduation). It’s not enough just to have an MBA; the concentration types of MBA degrees matter, too. MBA-holders who focused on finance, economics, accounting, entrepreneurship, leadership, marketing, and management can potentially double their income—another reason to consider a concentration in entrepreneurship, finance, or leadership. MBA graduates who majored in strategy enjoy early career earnings of $96,200 annually, while the same for human resources majors was only $48,400. Mid-career, those annual salaries average $149,000 and $79,200 respectively. In Augsburg University’s MBA program, students gain knowledge in applying course materials by studying in a cohort with fellow MBA students and exceptional faculty. This type of MBA program keeps a driven pace toward graduation, while also allowing for students to balance their own work and life demands. Get the Augsburg MBA experience at the location that works best for you: Minneapolis or Rochester, Minnesota. 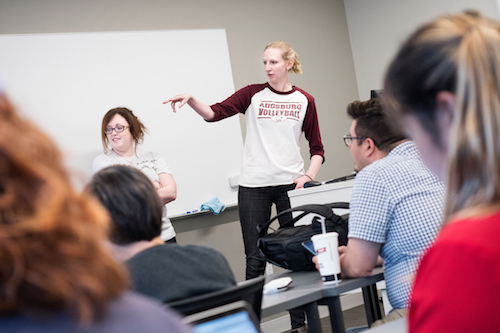 At Augsburg’s Minneapolis campus, small class sizes and classes that meet one evening per week at night are designed for working professionals like you, which means a complete degree is possible within 26 months. At the Rochester location, the Augsburg MBA can also be completed in less than 26 months. Classes meet one evening per week. Apply your degree to your work sooner and make professional progress in your company and industry. What else can you expect from Augsburg’s MBA program? Enroll in up to two study-abroad courses, lasting 10 days each. Learn from staff and faculty who understand what it’s like to be a MBA student and still work full-time. Grow from a supportive environment with your cohort, which includes other working professionals from a variety of career paths and industries. To set yourself apart from other MBA students and distinguish your professional value even more, consider a dual degree: an MBA/MAL dual degree or an MSW/MBA dual degree. Which type of MBA program is best for you? The best types of MBA degrees are from highly rated schools and experienced faculty and staff who’ve helped many students earn their degree and enhance their career. Have questions about MBA types and which is best for your career? Explore Augsburg University’s MBA program or contact mbainfo@augsburg.edu to talk with MBA professionals today. The MBA is one of the most common graduate degrees around. But when you survey the options, you wonder: is an MBA worth it? Pursuing a graduate degree is an investment in your future that will pay dividends for your career. If you work in a large organization or want to start your own company, you should consider a Master of Business Administration degree. What does an MBA give you that other degrees can’t provide? Since good business practice requires you to evaluate opportunity costs, take some time to consider the costs and benefits of an MBA. What are the benefits of an MBA? A Master of Business Administration degree accelerates your career path, opens up new opportunities for you within your organization, and makes you more marketable as your own personal brand. An MBA degree communicates to current and future managers that you are serious about your career. An MBA positions you to be more successful in job interviews. The degree helps hone your skills and enhance your personal knowledge in business. An MBA empowers you to think differently, make decisions using data, and opens your mind to new possibilities. If you really want to be set apart, and be an out-of-the-box thinker who can innovate and provide value to companies and start-ups, an MBA may be perfect for you. What happens to your career path when you get an MBA? Is an MBA worth it for changing careers or staying in the same one? If you want to climb the ladder to a new position in your company or position yourself for a job opportunity at another organization, an MBA is a significant way to prove you’ve got the knowledge and practice to succeed in that new position. Education is an investment. You put in time, effort, and money now with the anticipation that it will reap career and financial rewards later on. Will an MBA mean an increase in your salary? Is an MBA worth it to make more money? The short answer is yes; the data supports the argument that people with an MBA will more likely earn more money over their career. Choosing to get an MBA may unlock a more aggressive growth path for your career earnings. In 10 years, you may earn significantly more salary than your career path without an MBA. Compare the salaries of people who hold the same job—some hold only a Bachelor of Science/Bachelor of Arts, while some have a Master of Business Administration. For example, a marketing director with an MBA earns $132,000 annually, but a marketing director without an MBA only earns $101,000. Likewise, senior HR managers and IT directors earn 12% more with an MBA than without. If you don’t want to advance in a career of management, leadership, and high-level positions, the MBA is less important than work experience, developing practical skills, and other factors that influence your salary. Does it matter where you get an MBA? Why get an MBA from a highly rated institution with a recognized MBA program? 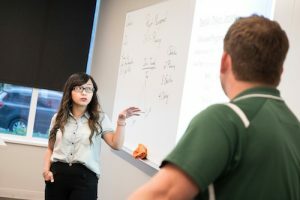 Without a respected school’s name next to your degree, the potential benefits of an MBA decrease in the short-term and the long-term for your career and salary. So is an MBA worth it? An MBA is worth it for people who have an undergraduate degree and know they want to work in business management, leadership roles, or start their own company someday. The MBA provides a knowledge base as well as practical experience learning alongside other ambitious students and exceptional faculty. Augsburg University’s MBA is an affordable and respected program designed for working professionals. 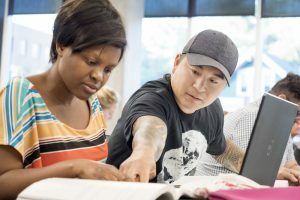 With the third largest MBA program in Minneapolis-St. Paul, Augsburg offers academic excellence with convenient class schedules and affordable tuition. 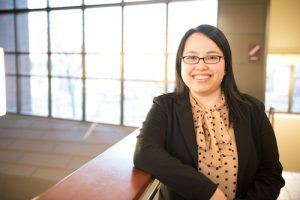 Why earn an MBA at Augsburg University? What do MBA students love about the Augsburg MBA program? One significant difference between MBA programs at various schools is the community of professors and students who learn together. The network of fellow MBA students in your cohort may not just be supportive during the two-year length of an MBA program, but may also benefit your long-term job opportunities and professional development. 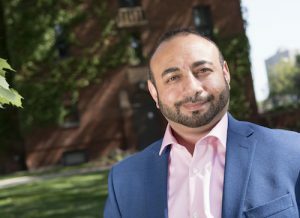 Augsburg MBA alumni have created companies with social impact; been inducted as fellow in a policy institute in Washington, D.C.; started a publishing company; and risen to district management and above in major corporations. 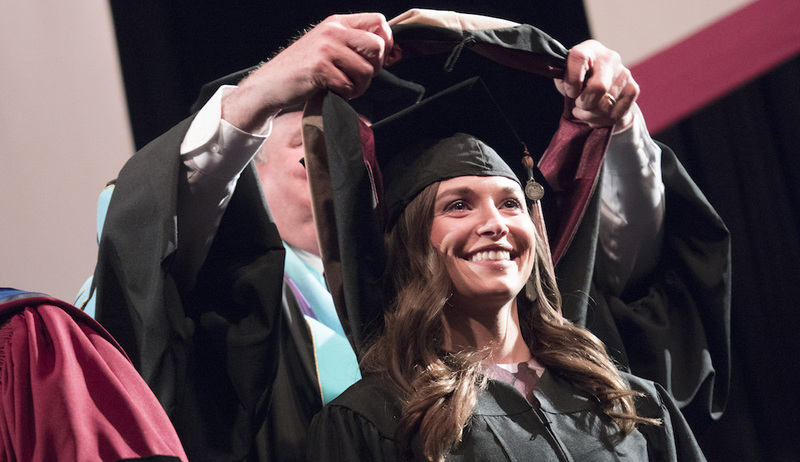 Why get an MBA at Augsburg like these noteworthy alumni? You have your own accomplishments to achieve and mark to make in the world. Professor Jeanne Boeh teaches economics and is chair of business administration in Augsburg’s MBA. She previously taught at Loyola University, the University of Illinois in Chicago, and the University of St. Thomas. She earned an M.A. 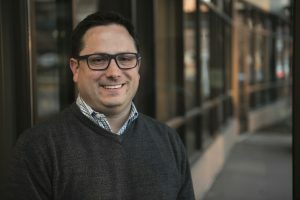 and a Ph.D., is a member of the Minneapolis Star Tribune Board of Economics, and is regularly quoted in the business section as an expert in economics. George Dierberger is interim director of Augsburg’s MBA program. He previously worked for multinational corporation 3M, where he orchestrated strategic plans, lead significant sales initiatives, and launched product lines for 25 years. He holds an MBA, an M.A., and an Ed.D., and has taught businesses courses at Augsburg, Bethel University, and the University of Wisconsin-River Falls. Explore the Augsburg MBA program with exceptional faculty and proven quality. Augsburg University’s MBA program is accredited by the North Central Association Higher Learning Commission and is a member of and candidate for Accreditation Council for Business Schools and Programs accreditation. Still wondering, “Is an MBA worth it?” Contact business professionals at Augsburg University or request specific MBA program information.